Who Was Esther? is a new installment in the Kingdom Files series by Matt Koceich. Written by an elementary school teacher, this series is targeted for kids ages 8 to 12. My six year old took an immediate interest in the book and pictures. Though she reads well, because of the length of this book, it is one for us to read together. Older children will be able to easily read the narrative by themselves. There are grayscale pictures throughout. The book is divided into three parts with the first part being the “Fact File.” This is very basic information about the character such as name, occupation, approximate time of life, etc. In this book, the “Fact File” spans two pages. The “Action File” is the longest section and retells the Biblical story of Esther, a Jewish orphan who became Queen of Persia and saved her people from annihilation. This section also features “clues” to aid the reader's investigation into discovering the life of the character and thinking more deeply on the text. The text aligns with the Biblical narrative, but it doesn't dip into the sexual aspects of the book. No mentions of harems and concubines. However, I didn't like that Esther being taken to the king was compared with people being saved by Jesus and brought into the Father's house (page 22). The “Power File” is the last section and my personal favorite part of the book. This portion features ten small devotions based off the story with a correlating Bible verse. I found these to be positive, empowering, appropriate for both genders, and suited to the targeted age range. In conclusion, Who Was Esther? 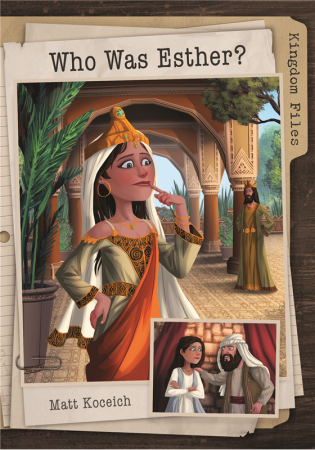 by Matt Koceich entertains and encourages children as it teaches the story of Esther and provides life applications. I received a complimentary copy of the book from Barbour Publishing and was under no obligation to post a review.